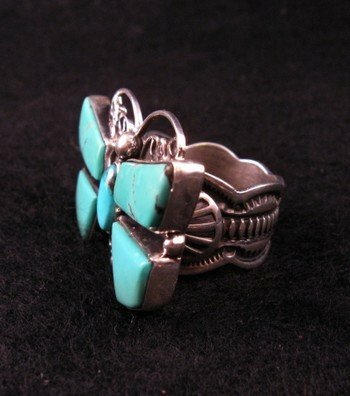 This old pawn style turquoise and sterling silver Navajo hand made ring has a beautiful turquoise butterfly as the centerpiece. The butterfly measures 1-1/2 wide by 1 tall. 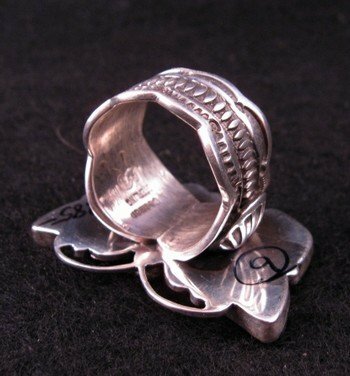 The wide ring band is decorated with traditional stamping, repousse work, and scalloped edges. An antique satin finish completes the old-style look. The turquoise stones are not cracked or chipped. That is only natural matrix that you see in the photos. 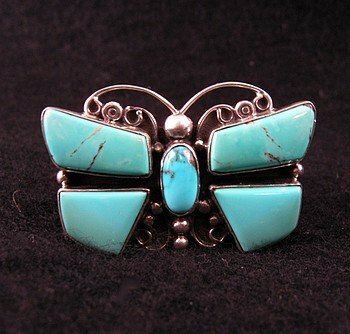 This sterling silver and turquoise ring was created by Navajo silversmith, Darrel Cadman. Darrell Cadman is the brother of silversmith Andy Cadman. If you have never had a piece of Darrell Cadman jewelry, you will be very impressed, and if this is another Cadman piece you are adding to your collection, you will be very satisfied.